Never before have I worn down the teeth on a bike cassette. 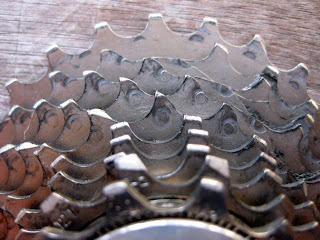 Discovered today when the fresh chain was skipping furiously when using my most commonly-used cogs (15, 17, 19 tooth). Some of the teeth on those cogs have been ground to a fine point. I guess I should have replaced that chain sooner as the cassette is quite the pricey piece. And it was only 18 months old.